Also known as a power cage, full cage or squat cage, a power rack is a popular piece of weight training equipment that is mainly used as a convenient workout station for freeweight barbell exercises such as squats and bench presses. 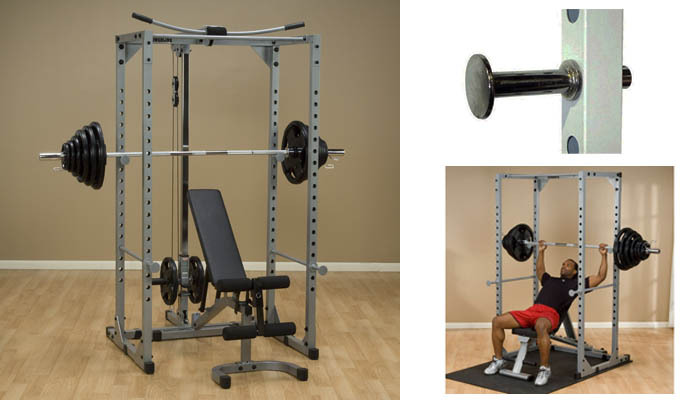 As opposed to a half rack or squat rack, a power rack surrounds the user with 4 upright steel tubes, thereby stopping or catching the bar if necessary, for example if the user should fall either forwards or backwards during a squat. This makes it safe to work out alone without a friend to spot you. Power racks also usually have a pull up bar and a few additional features or options to add to the number of exercises you can do, making them the staple piece of equipment in many home gyms and an important piece in commercial gyms. Grade – Commercial racks are heavy beasts meant to hold up to abuse all day and never move. They can’t be tipped over, and they are sometimes pretty tall to give you a nice height for a pull up bar without your feet touching the ground. Light commercial racks are not quite as heavy but are still good for some commercial use and well-respected by home users wanting good equipment. Home racks are lighter still and may require more careful use or lighter loads. For example, if you’re doing 300lb squats and walk the barbell hard enough into the uprights to re-rack it, or fall forward, the rack may tip. If you’re more careful then it isn’t such an issue. Home racks also may wobble when you’re doing pullups. Steel Tubing – The gauge is the tubing wall thickness. The lower the number, the thicker and heavier it is. Larger tubing sizes like 2″x3″ add strength and stability. So larger tubing and heavier gauge naturally go together to make a rack more heavy duty. For example, on the low end, a 14-gauge, 2″x2″ might be slightly wobbly for pull ups, and you can tip it over if you try, but it’s fine for most people in a home environment. 12-gauge 2″x3″ is a very stable and tough rack even for experienced athletes lifting a lot of weight. On the high end, an 11-gauge 2″x3″ rack is made for commercial environments or university weight rooms. Height – Shorter racks can fit under a standard 96″ ceiling with several inches of clearance for pullups. Taller racks are great for high ceilings, because your feet will be completely off the ground for pull ups. A 6ft tall person will want about a 8ft (or 96″) tall pull up bar. 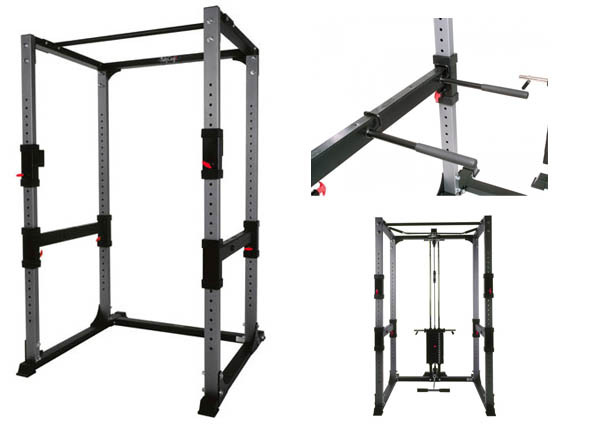 Tall racks also let you do standing military presses inside the safety of the rack without hitting the top. Weight – The heavier, the more stable. This is based on the steel tubing used, as well as the size and design of the rack. The really heavy ones are impossible to move without a lot of help or disassembling. Hole Spacing – This is the space between each setting that you can set the bar catches and safety arms. If you will only be squatting or doing other standing exercises with it, this doesn’t matter much. For bench pressing, people get picky about hole spacing in regards to the safety arms. The reason is that when you’re doing bench presses, the safety arms should be set just below your chest height, so that if you fail a rep you can still set it down on the safety arms and wriggle your way out. If you set the safety arms too high, you’re going to bang into them at the bottom of each rep, while if you set them too low you’re going to crush yourself before they catch the failed rep. So 1″ hole spacing is fantastic for that, while 2″ is ok, and 3″ is too much. Of course, you could get lucky and one set of the 3″ spaced holes is exactly where you need it, or you could lay extra mats in the rack until it’s just right. Weight Capacity – We purposely didn’t add this attribute. Manufacturers come up with his number how ever they want, so it’s only useful in comparing models by the same manufacturer. The Grade tells you what you need to know. The safety bars on any rack will bend if you drop a heavily loaded bar onto them from high enough. As a rule of thumb, if you have the barbell loaded to 400 lbs on a Home rack you should be upgrading to a Light Commercial rack just for the extra stability alone. Commercial racks are made to take any amount of weight a human can lift. A Lat Attachment is a double pulley system that installs to the back end of a rack, for doing exercises from the high or low pulley, such as lat pulldowns, rows, tricep pressdowns, curls, etc. Some include a leg hold-down so you don’t lift yourself up while doing lat pulldowns. Plate Storage saves you the need for a separate plate tree. But racks that include plate storage posts on two of the main uprights will pose a problem for the range of motion of some exercises if you store larger plates on them, particularly the higher posts. The more expensive designs like the York racks have separate uprights on the rear for the plate storage posts, ensuring that the plates are always out of the way. Dip Handles attach to the front or side of a rack, for doing dips. All of them are height-adjustable, using the same holes the safety arms use. Band Pegs are for attaching rubber bands to, to create a resistance curve. Pegs are included on the top and bottom of the rack. Loop each end of the band around a peg and the barbell. When you attach bands from the top pegs, they assist in the bottom portion of the lift, reducing resistance in that portion of your lift as the band tension increases. If you attach them to the bottom pegs instead, it does the reverse, pulling down on the barbell more during the upper portion of the lift. Outside Spotter Arms are useful if you do exercises on the outside of the rack. For example, you may do military presses off the front of the rack because you will hit the top crossmembers if you do them inside. Another reason might be if the rear horizontal portion of the rack frame interferes with your particular bench, in which case moving the bench forward and doing presses off the front of the rack solves the problem. These are also called safety arms or safety catches. Technique Scoops are for setting the barbell to a certain for training rack pulls or the second pull portion of cleans. The curved platforms support plates (preferably bumper plates) instead of the bar itself. Other things to consider we haven’t listed due to space constraints in the chart above, or they are too unique to compare. The Kip Cage is, as of writing, the only rack here made to be optionally bolted to a concrete floor for extra stability. In the old days, all racks were made that way, but manufacturers figured out that for larger racks it isn’t necessary, and for smaller racks they could improve stability by having the feet stick out farther horizontally. We list the inside depth in the product descriptions. That’s the measurement between the front and rear uprights, or in other words your working space. The deeper it is, the more freedom of movement you have. This may be a positive or negative, depending on if you want the uprights to save you quicker if you start falling forward or backward. Some racks have straight pull up bars, and others have multi-grip pull up bars. Purely personal preference. The multi-grip of course gives you more options. For even more info, see our collection of the best articles on power cages. A well-respected entry-level rack that has been around for many years and made by Body Solid, a trusted brand. It’s a good choice for people who aren’t moving stacks of 45lb plates. It works for most exercises up to 300 or 400 lbs. Body Solid gives a weight limit of 600 lbs and a 10-year warranty, so it isn’t going to break, but I wouldn’t go that heavy. Although it’s a lighter weight rack, A 180lb person can do strict pullups without it wobbling. The 82″ height makes this rack fit comfortably under a standard 8ft ceiling, with enough room for your head above the pullup bar without knocking yourself out on your ceiling. A basic heavy duty rack that is built like a tank, supported by BodyCraft’s lifetime warranty. It weighs 282 lbs before any attachments are added, so it’s not going to move on you easily. The safety arms and bar holders have spring pins that are easy to adjust. No removing the entire thing and sticking them in another slot like you have to do on the Powerline rack. If you change exercises a lot, this saves you a lot of time and annoyance. You can get a lat/row attachment that has an optional selectorized weight stack as well, so it’s your choice whether to load it with freeweights and/or install the weight stack. Interesting Article! Now I know which one might suit me better.